"I've met like four Anikas," Anika Armstrong says, only slightly surprised she'd found others with her first name. "But I met one kid at school with a heart condition and I was blown away." Anika was born with an atrial septal defect or ASD. "It was repaired three years ago. The repair was small, but it has made a huge difference," she says. Sitting in the heart clinic waiting room recently, Anika spotted a tiny notice for Merry Heart Children's Camp and was immediately excited about volunteering. "I just think it's so great," she says. Like fellow counselors Max and Dave, she's looking forward to her duties at the camp so she can visit with other heart patients and watch the campers develop relationships of their own. She wants the campers to know they're not alone and that there are other kids like them. Anika just graduated from Battle Ground High School and the Clark County Skills Center Criminal Justice program. She's been an Explorer with the Clark County Sheriff's Department for two years and plans to start college in the spring. The coolest thing I have ever done would definitely be when I went to Georgia, North and South Carolina last summer. I went with eight other students from Washington state to propose laws and debate at the YMCA Youth Conference On National Affairs (CONA). The delegates made me proud to be an American and confident in our future as students and as a country. It was an amazing life changing experience that I will never forget. Are you an outdoorsy person? What do you like the most about being in the woods in Oregon? I love hiking or just walking through the woods. My favorite is when I randomly find a water hole to swim in. Do you have a motto, a mantra that you keep in the back of your mind? Who or what do you respect the most? I respect the people who are everyday heroes. Doctors, cops, really anyone who does something good for others on a daily basis, people who work to make a brighter tomorrow. Did you have a chance to go to a camp as a kid? Yes, I went to a summer horse camp a few times. I remember stepping out of my comfort zone and meeting new people and trying new fun things. Dave’s life started with a surprise diagnosis of a heart condition that is now usually detected before birth. Within a few months, he’d had several surgeries to correct the transposition of the great arteries. He’s now in medical school at OHSU and will join the Merry Heart team as a cabin counselor. His experience as a heart patient who’s entered the medical field himself adds a layer of understanding and knowledge to the crew. Like many young heart patients, Dave didn’t know any other children with a heart condition growing up. He shared his experiences and questions with his parents, but not with his friends or siblings. He’s excited to be on both ends of the dialogue with the campers. “I hope that being able to share my experiences, both as a patient and also as a young adult who has been fairly active and successful in pursuing an education and a career, will be meaningful to these kids. I am as much looking forward to being helped by them myself as I am to helping them in any way I can,” Dave says. What do you do everyday for work, school and play? I just started my second year of medical school at OHSU so that covers most of my working and schooling. Inspired by my parents and siblings as well as some incredible athletes in my class at OHSU, I’ve recently started running which I enjoy, but sometimes feels like more work than play. I grew up loving to play and watch baseball, although my home team, the Philadelphia Phillies, have been pretty miserable lately. I haven’t played on a team since I was a teenager but I still love to play catch and try to hit a baseball as far as I can. I’ve also played the violin since I was very young and enjoy playing, listening to, and watching classical music. I was fortunate enough to land a summer internship in college that paired me with the Tennessee Donor Services office in Knoxville, TN. I spent the summer driving around with the organ transplant coordinators on organ recovery cases, driving for hours to work on a case and getting to scrub in to help the surgeons on in a couple instances. I’ve done plenty of interesting medically-related things in my time at OHSU, but this internship in Tennessee was my first serious exposure to some of the wildly incredible things that healthcare workers do on a daily basis. I am more of a budding wannabe outdoorsy person. In the last few months I’ve had more opportunities to get out and do a little camping and hiking. I grew up in Philadelphia, PA and envy the Oregon natives who have grown up among so much beautiful scenery. In the time that I have spent in the woods here in Oregon, what I like most is the feeling of looking out at the mountains miles away, surrounded by a forest that comes right up to your feet. I enjoy the feeling of being among something so expansive while simultaneously experiencing the comfort and coziness of the tall sturdy trees that line the hiking trails and camp sites. While Josie has been an artist for years, her recent work teaching and counseling has refocused what art actually means to her. 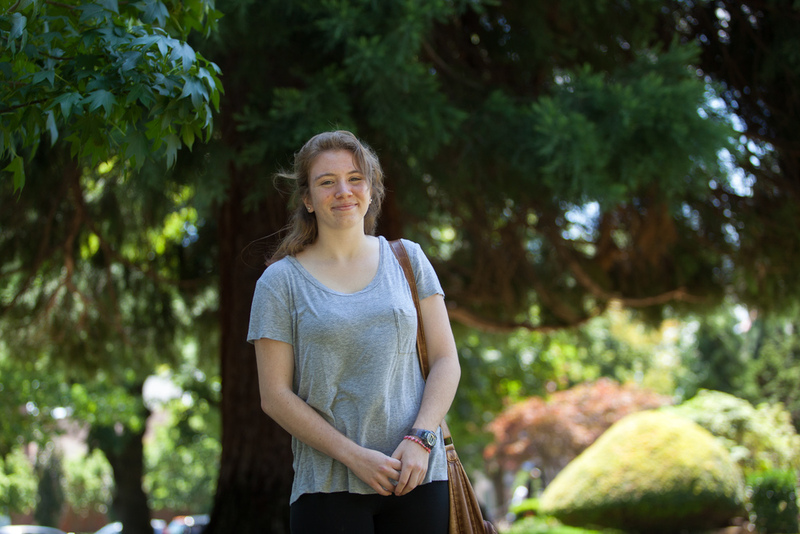 Now in her second year of the graduate program at Marylhurst University, Josie plans to have a career in art therapy and counseling. She spent ten years going to the summer arts camp where she now teaches and enjoys working with children. Last semester Josie helped Alzheimer's patients learn to draw, paint and collage. "We did different projects each week and would have discussions after the working period about what they had made and what it reminded them of," Josie says. "I learned once again how art can be a powerful way to reach people who are struggling." We're looking forward to having Josie out to camp on Thursday to teach campers ceramics. What do you do everyday for work and play? Right now I am a student at Marylhurst University working on Masters in Art Therapy and Counseling. I am entering my second and final year of school and will be doing an internship at a therapeutic middle school providing both group and individual art therapy for the students. In my free time I like to garden, read and cuddle with my cats. I love the Ocean. I go there a lot to swim, look for shells and rocks on the shore, boat and fish. I also enjoy do art. Throwing pots on the wheel is my favorite type of art but I also do knitting and mixed media art. What do you hope the campers gain from art? Clay is not a media that everyone gets the chance to explore. My involvement at camp will hopefully provide new and exciting experiences for the campers. Being creative is a great way to relieve stress and to keep the mind active, which are valuable skills for these campers. Max Radke, 17, likes to live by the Boy Scout motto "Be Prepared". Nothing, however, could prepare him and his family for the medical emergencies he's powered through since a young age. At age 10, he collapsed from right-sided heart failure and soon found himself on a transport flight with OHSU's Panda team to San Diego to remove blood clots associated with pulmonary hypertension. He's now a leader in the Boy Scouts, a musician, a big fan of video games and this fall, he'll be a senior at Scappoose High School. "I'm already thinking up the senior prank," Max says. Through his work with many clubs and groups, he has a good idea of what kids like to do these days. So it's a perfect fit for him to bring his quiet charm and leadership abilities to Merry Heart Children's Camp as a counselor. Max has first-hand knowledge of what it's like to live with a heart condition and is anxious to share what he's learned with campers. "I want to show them that even with their conditions, there are so many people out there that will go out of their way to help them. No matter how much your condition has changed your life, you will always be able to find a way to conform to a world that, today, has a place for anyone. No matter who they are." Besides the simple pleasures we all love like food, warm showers, and Netflix, I love playing some of my favorite songs on piano. For about the past year I have also worked toward playing songs on a guitar. Although not a defining fact and center point of my life, playing music puts me in a good mood. Most people prefer a certain genre of music. I care little for genre and simply like to listen to music with power and poem. I will also go to great lengths to get a good laugh out of myself and others. I have never left the West Coast of The United States, but I have gone camping all over Oregon and in many parts of Washington. I have not recorded my camp experiences, but I believe that I can safely say that I have done somewhere between 100-200 days camping. That should speak for itself. I have been to at least 5 or 6 week long summer camps during my life. I have gained an understanding of the outdoors and the kind of people who like to be there. I have met a large number of people and if I keep it up, I am sure I will meet a great many more. Besides mottoes taught to me by the boy scouts like "Be Prepared", I have my own motto "Be thankful for your trials." Problems in our lives are experiences. The more you have, the more you are prepared for the next one. I try my best to put myself in these situations so as to gain experience for my future trials.